We’ve almost reached mid year, and over the last weeks, we’ve seen Brent moving slowly upwards towards $50 per barrel. Although it’s too early to say if this upward movement can be called a trend, it does nod towards the prospect of prices that could turn things around. Cost cutting technologies and business practices are already helping some – and these should help ease the way toward realising fuller benefits from higher market prices. When it comes to refined products, OpenLink tells us that as the market changes, so too do the market participants – and that the smaller players are the ones to keep an eye on this year. Smaller traders can be more flexible in terms of their trading strategies and approach to risk. Enpro Subsea discusses its revolutionary suite of products – the patented Enhanced Subsea Sampling & Injection (ESSI) system – which ensures field development solutions are simplified through an innovative universally adaptable production enhancement technology designed to deliver on any subsea tree. Core data is used throughout the life cycle of a well to make fundamental strategic decisions. From Corazon Oilfield Services, we have a look at the case for coring, pointing to the current market place with dramatic reduction in rates, as well as an increased availability of premium products and personnel. From BMT Cordah, we hear how using Comparative Assessment methods to aid in determining the optimum options in pipeline and jacket decommissioning. The challenge of the complicated relationship between decommissioning costs, potential environmental and societal impacts, and safety can overcome by Comparative Assessment, which provides a clear and transparent ranking of the alternatives that is robust as well as accessible to all stakeholders and regulatory bodies. The present slump has proven to be a spur for innovation for some in the oil and gas industry. And Trolex explains how for them, innovation is a focused activity aimed at the development of a myriad of practical solutions. For Trolex, innovation isn’t solely about technology and engineering, it’s how they encompasses the way they organisationally work. We also have an interview with CD-adapco’s Director for Business Development in the oil and gas industry, who tells us more about the company’s flagship product, STAR-CCM+®, which enables users to develop better designs, faster, through the application of computational fluid dynamics (CFD), and HEEDS® – and thus drive innovation and lower product development costs. We include a look at Norway’s recent licensing round, which offered 10 licenses to 13 players in the far North offshore sector. And from GAC, we hear how the company is well placed to provide logistical support for expected rapid growth in Northern operations, including the their activities in Russia concerning the Northern Sea Route. 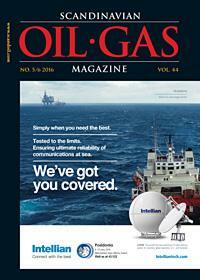 As the summer progresses, we’ll be busy working with our next issue that we’ll be distributing at Offshore Northern Seas – ONS 2016. Two major topics this year are Transition and Long-Term Perspectives, which are very timely indeed. So whether you’re planning to attend ONS, or if you’d like to tell the ONS audience more about what your company does, let us know. We’d like to hear more about how you’re preparing for the upturn.